Pillow & Toast Unicorn Rainbow Wall Art: Set of FOUR 11 x 17'' Posters for Girls Bedroom, Teens GOOD VIBES to Decorate Room - 4-Pack, Girly Magical Unicorns. UNICORNS PRINTS SIZE 11X17! 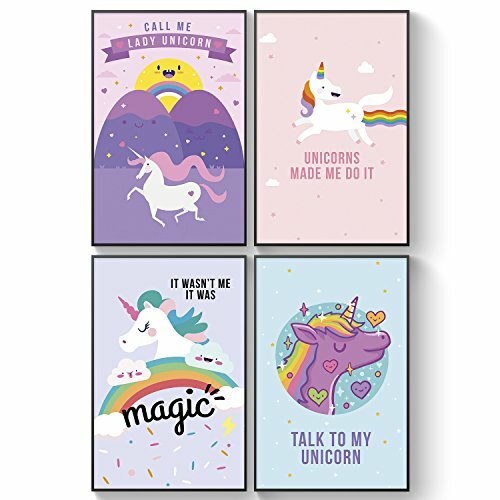 - This multipurpose unicorn posters set is the best home teens room decor gift decorative item, your girls can place each poster anywhere they want. Their high quality makes them an stunning and special present. It can also be used as a baby's room decoration. MAGIC LOVER GIFTS - These could be an excellent choice for a just married couple whose about to move to a new home, a new fresh start. We suggest you visit our store to check more options about home decor, posters, art prints and more! THICK CARDBOARD - Printed on 300 GSM acid-free offset paper on top of high quality 1MM Cardboard, these art prints are thick! Most art prints sold on Amazon are printed on plain paper. These are high-quality prints! ART ON WALL GIFT - These are unique pieces with the best interior design concept for open and illuminated areas. This has been designed and printed by a group of people who is committed to offer you the best. LOVE IT OR YOUR MONEY BACK! Your satisfaction is Pillow & Toast's #1 priority. We are so confident that you will love our Set of 4 Rainbow Unicorn Edition posters that we are offering all customers a lifetime guarantee. If at any point you decide you are not completely satisfied just drop us an email and we will refund 100% of the money.